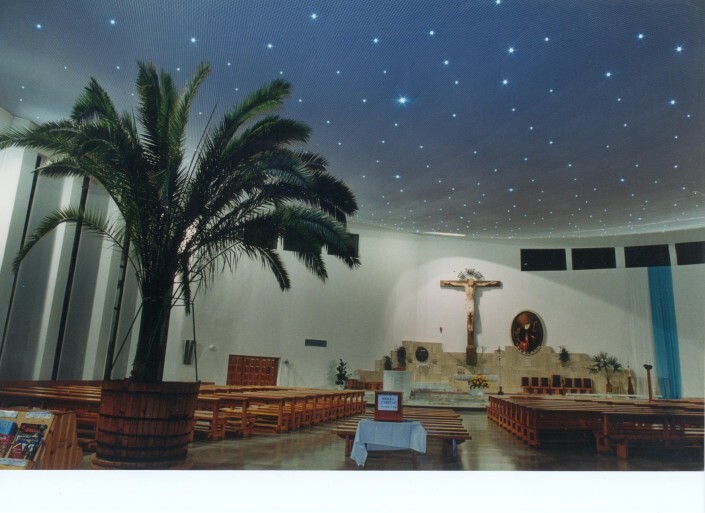 Ourgrid false ceilings are usually used in a purely exhibition, commercial and fair sectors, always in the most prestigious and elegant locations, but in Poland we are honored to participate in the construction of religious buldings too. 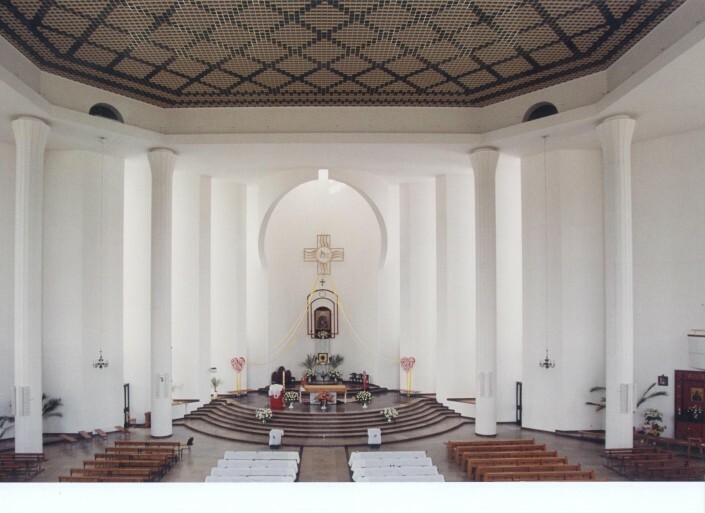 Here, in fact, there are many churches with historic architecture, but also many new buildings designed by famous contemporary architects who make use of innovative materials. Thanks to our Partner, following for many years and with success the Polish market, we can mention with pride among our references, three churches in Krakow and surroundings, where our grid false ceilings have been included in an exemplary way, making full use of existing great surfaces (from 800 to 1600 mq in a single surface) and giving a unique and original connotation. In all three cases product lightness and assembly characteristics are better than those of other kinds of grid false ceilings. Metal is in fact heavy and more suitable in shopping malls, lightened plaster and wood are really unrealistic for such buildings, not to speak of drywall, that can not be used on so large surfaces. Furthermore a better inspection is ensured by plastic false ceiling, removable and restorable at any point with the guarantee to reinstate a unique surface after intervention. In a time when many buildings seem arisen “at random”, with these three churches architects and builders made a through study of the worship and meditation places. 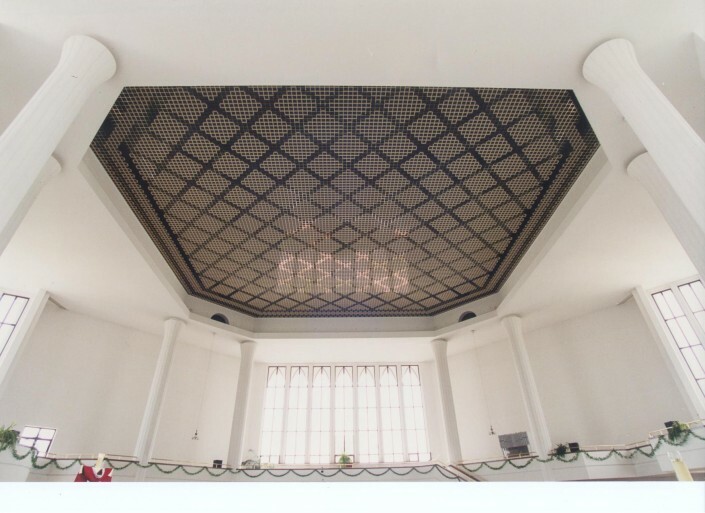 In the Holy Albert Brother Church ( 303 Dywzjonu street, Krakow), art 159, 200×200 mm mesh, single element, self-extinguishing, the last to complete the range of PPP ceilings, is used here with a great decorative effect, matching “cream” and “metallic brass” colored elements, to create a single surface with a regular geometry, installed some 15 metres high. Saint John Kanty Church (Armii Kajowej street, Krakow), art 129, white, auto-extinguishing false ceiling (40×40 mm mesh, panels 600×600) is installed not perfectly flat as indicated by our “classical” instructions, but using hangers of different lenghts, suitable calculated to maintain the curvature within the material flexibility range. The result is a gigantic curved section, giving the effect of a large net of biblic inspiration. The coupling seal between panel is guaranteed by a special and invisible interlocking connection system. Given its size, it’s not possible to photograph the fully installed surface. Photos express only in part the complexity of this work of art, installed to tens of metres high, following a project daring but perfectly integrated to the sacredness of the place. Lighting consists of a starry sky in dimmable leds, illuminated for the first time on christmas eve at the stroke of midnight, with a really striking effect. Holy Cross Church (1, Mieszka street, Katowice) is the most recent project, not yet fully completed. We intend to visit it once finished and post pictures on our blog. 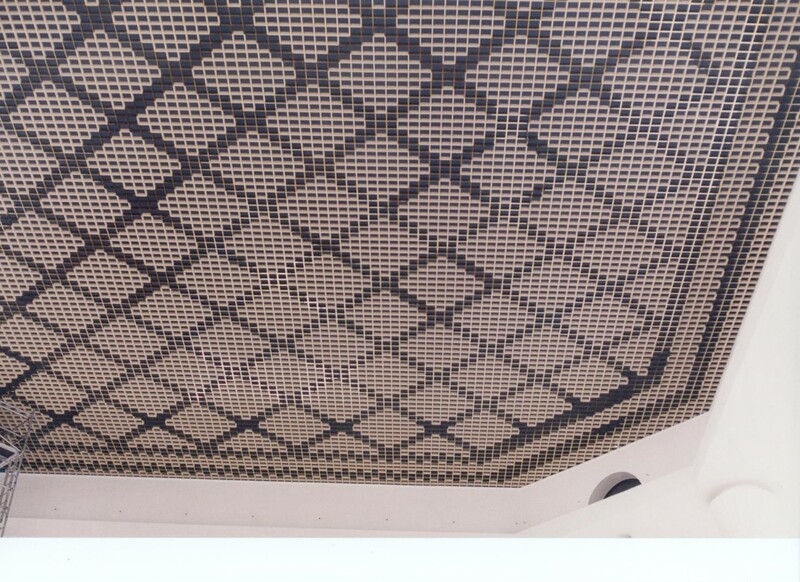 Here is used art 129, 40×40 mm mesh, panel 400×400, in self- extinguishing version EN13964, Euroclass Bs2dO (in line with the strictest european standards, thanks to the latest generation thermoplastic materials selected by our best suppliers).